Your contribution helps us persevere! 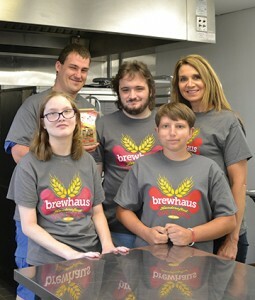 CP news: The Brewhaus Baking Company (BBC) is an amazing local organization that supports kids with disabilities through innovative programs. BBC is an organization that we learned about through Jason’s high school, and one that he participated in to his great delight. This inspiring non-profit takes leftover grains from local brewpubs to make pawcrafted, all-natural dog biscuits that are sold around the area. The coolest part is that students from special needs classes in local schools are the chefs, bakers, packagers, and sales force. The program uses this activity to teach important transitional and life skills, and proceeds from the sales all go back to help local disability organizations. How cool is that? Jason was very involved last year and loved his work. He contributed to many of the tasks, including the preparation, cooking, and packaging. The group was very smart in utilizing his best skill, which is enthusiastic awareness and enthusiasm. Few passersby could resist his smile, charm, and infectious pitch. You can read more about the Brewhaus Baking Company here. Be sure to like BBC on Facebook! Outreach: We have been very fortunate to have been recently profiled in Impact, the Cincinnati Children’s donor magazine! A feature article relates Jason and family, along with Pete’s quest and our overall community efforts to support Children’s Cerebral Palsy Program. We’ve already seen the impact from increased donors who have generously contributed to the cause. Don’t be shy, there is plenty of time to add your support, or to spread the word. Fundraising: We are nearing $1500 in donations, with most recent kindness from Andrew F. and Anne R. Thanks so much!